The upcoming motion picture JUSTICE LEAGUE assembles various characters from DC , with Batman heading up the team. 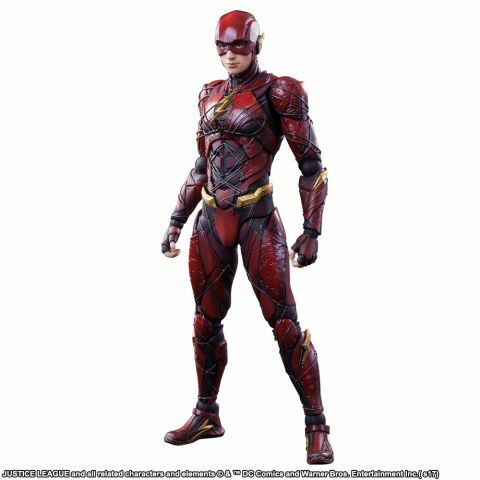 One of the members of this dynamic group is "The Fastest Man Alive", The Flash, now available as a PLAY ARTS KAI action figure! The paint application creates a clear distinction between gloss and matte textures, while the color scheme pursues the highest fidelity possible. The overall finish exerts a sense of presence that truly packs a punch! At the same time, the action figure allows for a wide range of motions, enabling various poses from the movie. Enthusiasts who enjoy the true essence of action figures, will be delighted by this high quality PLAY ARTS KAI!